High school semester grade point average (GPA) refers to the GPA over a particular semester. How is it different from core, weighted, unweighted, or cumulative GPA? Your cumulative GPA is your grade point average for all completed High School semesters. Your unweighted & weighted GPA’s is used to define your semester GPA. 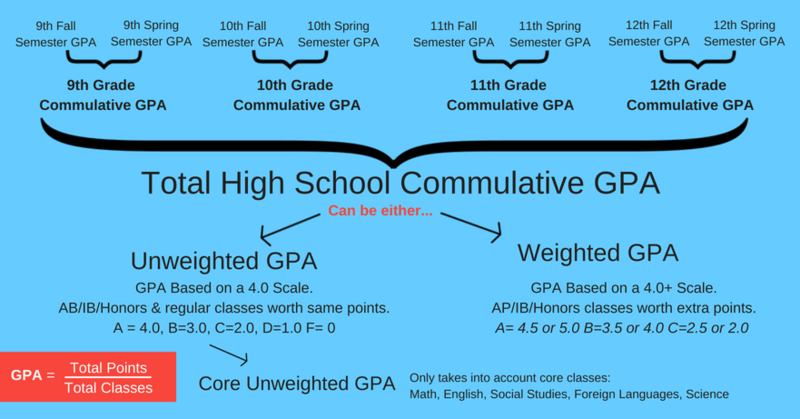 Your core high school GPA is your commutative unweighted GPA not including classes in fine arts or personal skills. How is your High School semester GPA calculated? Since all high school classes are worth the same credit, you take the average GPA of all the classes you took for a particular semester / the number of classes. Your semester GPA can be weighted and unweighted. Unweighted Semester GPA: GPA based on a 4.0 scale. 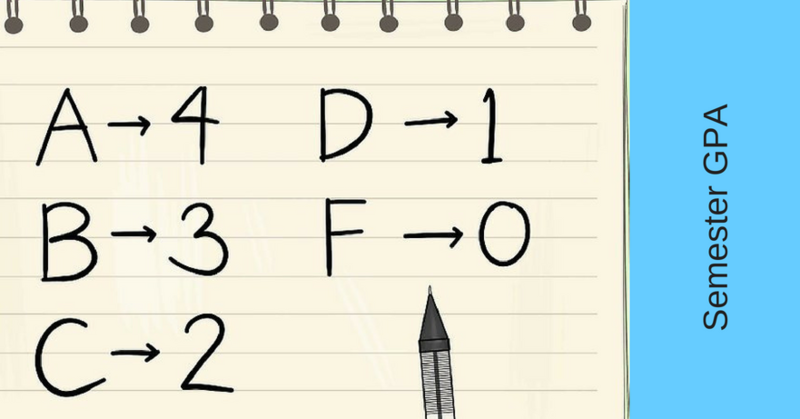 Where an A = 4, B = 3, C = 2, D = 1, F = 0; no matter if it is honors, AP, college, or regular. Weighted Semester GPA: GPA based on a 4.0+ scale. Where an A could count as 4.5 points or 5+ points, B = 3.5 or 4, C = 2.5 or 3, etc. for taking honors, AP, or college classes. This depends on what your high school decides. For example, let’s say you are currently in 10th-grade and are trying to calculate your High School GPA for the semester. They care mostly about your cumulative 9th – 11th-grade unweighted GPA. Therefore, when calculating your semester GPA, we recommend you omit non-core classes, don’t worry about the weighted GPA, and include past semesters to also determine your cumulative GPA. If your high school semester or cumulative GPA is lower than a 3.7 GPA, check out our 5 free tips to raise or improve your high school GPA! Do you want actionable advice, student & test prep checklist and more based on your current unweighted GPA, weighted GPA, core GPA, SAT/ACT/PSAT test scores, and grade level?